I might as well admit it. I’d rather ride, build and customize motorcycles than do almost anything else. I want to build bikes from scratch. I want to take old machines and breathe new life into them. I want to customize scooters from the wheels up. I’m slowly maneuvering my life and career to make room for doing this kind of work, even if just as a serious hobby. This winter, that kicked off in earnest thanks in a major way to Bluecat Motors in St. Paul. Jeff and Ryan, the owners of BCM, approached me a few months ago to become their online documentarian (read “blogger”). In return, they graciously offered to teach me how to work on my own motorcycles. What began as just advice soon turned into an evening here and there with my wife’s motorcycle literally up on the lift in their shop. 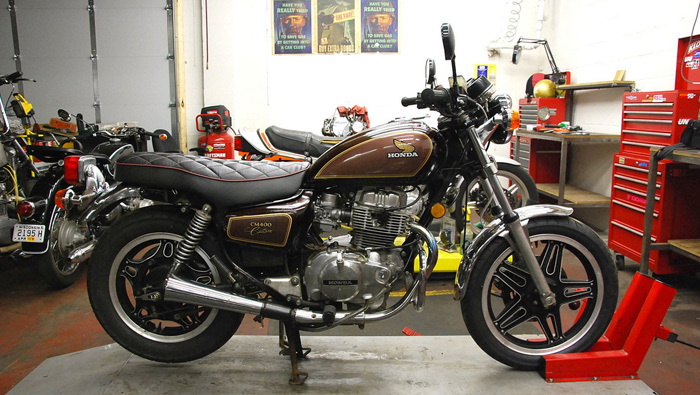 If you read my Weekend Away post, you’ll recall that my wife’s 1981 CM400 Custom blew a head gasket just outside of town. I’d planned to tackle that job myself, armed with my service manual. Instead, Jeff walked me through the whole job and actually taught me how to pull a motor apart, rather than me fumbling through it on my own. In retrospect, I could have done it alone, but I’m very glad that Jeff was there as my guide. He really took the lead on it and in the end I was more his assistant, which was great. For example, he give me the heads up that in changing the head gasket, I needed to also change the lower gasket between the cylinder and the crankcase. I wouldn’t have known to do that on my own. We stripped the engine down and back up in just one evening. I’d thought of a motor rebuild as one of my major remaining rites of mechanical passage. 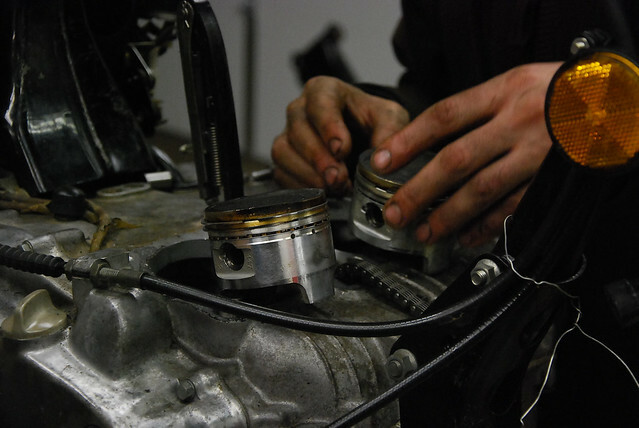 This gasket job was basically the same kind of thing minus re-ringing the pistons or honing the cylinders. It went great, but when we fired it back up afterwards, it was only running on one cylinder. Turns out the carbs were all fouled up. So on a different evening, I learned the dark arts of carburetor rebuilding. It actually wasn’t as bad as I thought it would be. I thought we were just doing a carb clean, but at the end of it all, Jeff called it a rebuild. Makes sense in retrospect. We replaced quite a few o-rings and readjusted the pilot jets. It had a bad accelerator pump as well. As great as it was to learn how to properly recondition a carburetor, what was even more valuable (and interesting) was to actually learn how a carburetor works. Getting this bike back in running condition has included Jeff really filling in some big holes in my motorcycle mechanic’s knowledge base. 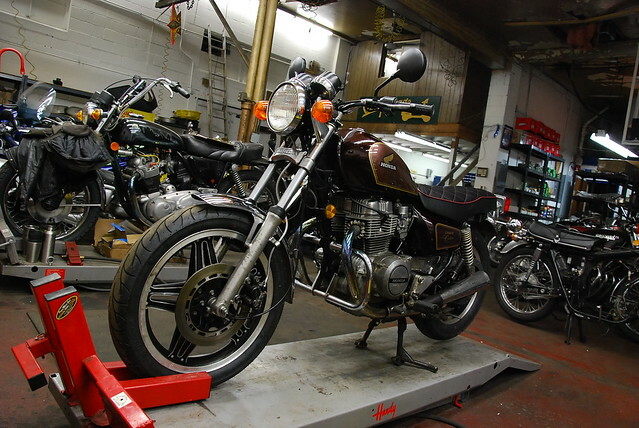 Where before I was familiar with adjusting valves, syncing carbs and other useful things, now I actually know how to do some of the big stuff. I’m quickly approaching what I think of as the baseline mechanical skills that would let me buy a barn bike and get it going again. I’ve just bought a barn bike of sorts, actually, but that’s a story for another day. With the bike now running like new, I started thinking about some custom touches for The Mrs’ bike. There were practical aspects to be considered. For some reason I can’t begin to reverse engineer, all of these early ’80s Hondas have these weird, pseudo “ape hanger” cruiser bars on them. They’re terrible handlebars. They put your hands at about shoulder level and force you to twist your wrists at a pretty uncomfortable angle. It hurts, frankly. So a set of more conventional, lower handlebars was a must. These old cruiser standard bikes also tend to have stepped seats on them. The problem there is that you’re stuck with one seating position. So a bench seat was also on the “must” list so that she could slide front to back and get comfortable. Jeff had another great idea to customize the CM. Besides steering me away from shoe-horning this bike into some sort of half-assed Cafe Racer, Jeff suggested we shorten the stalks on the turn indicators. He called them “lollypops”, which is exactly what they looked like. We ended up doing all of these things, but as a surprise for my wife. I got her buy-in before we did anything, but she had no idea that we were going to actually do the work. So while this project was no American Chopper episode, I did work directly with a custom upholsterer on the seat. 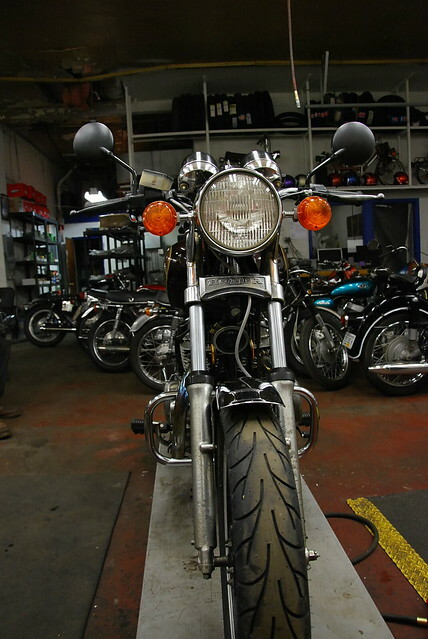 Jeff and I installed the new handlebars, shortened the control cables and replaced the brake line. I also helped with modifying the turn indicators. In the end, how this bike turned out wasn’t even my vision, but it was my project, and it was for a client (The Mrs). 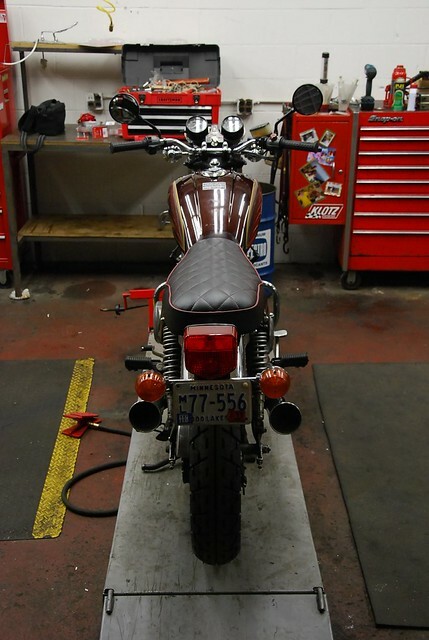 It’s hard to articulate just how satisfying it was to finally bolt on that custom seat and see the finished motorcycle. It fed something in me that I’ve been really eager to cultivate. Even better, I’ve gained friends in the shop at BCM. Jeff put it best. “I really like the friends that motorcycles bring me.” Me too, Jeff. Me too. If you’d like to read the full build story, you can get it over at the Bluecat Motors blog. You can also see more photos (including “before” pictures) over at my Flickr stream. Oh, and in case you’re wondering, she absolutely loved what we did with her bike. That’s perfect, because I really loved doing it.